Love the tweed one, number 3! Have a great Bank holiday by the way. the last one! love the clear base! enjoy Monday Will, wish Mondays were always off! Number 3 is calling for my husbands office! Such a great simple statement. Love! 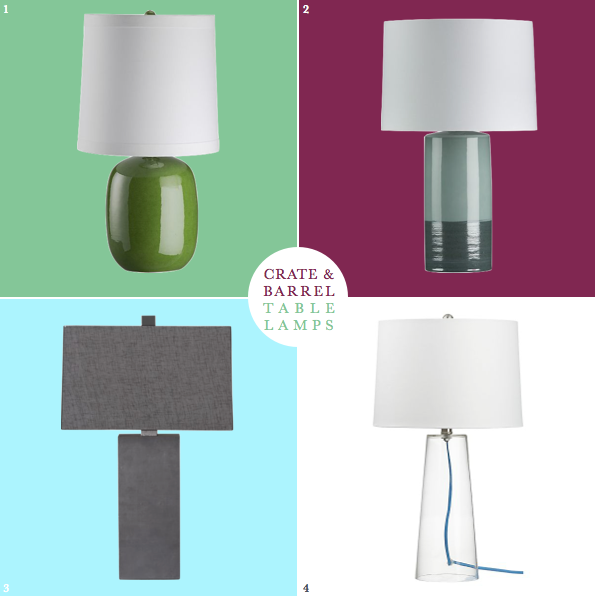 i heart crate and barrel! the green one is lovely!! No. 4 for me please with a red cable! Enjoy the walk and holiday Will! i like them all actually ~ but if i had to choose i would go with #4!! happy monday to you! i so wanted your help picking the lamp for my dorm, but i found a cool wooden based one. it has like tripod legs and a tweed shade. super cool. my favorite of these though is the glass one with the blue cord. super clean. I am loving the green one!